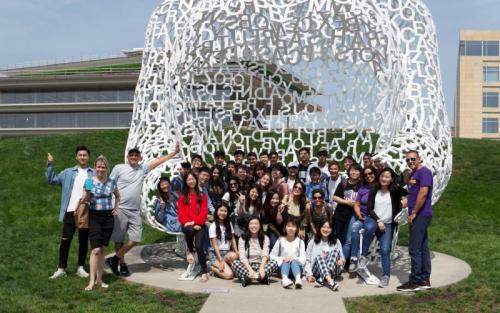 If your goal is to learn English while experiencing American culture, CIEP Immersion Programs at the University of Northern Iowa offer English language courses that focus on conversation and speaking skills as well as customized coursework in U.S. American culture. The learning process at UNI CIEP does not just enable you to pursue your academic goals for studying abroad, but allows you to learn English while exploring American culture through experiencing U.S. customs and holidays, meeting American students, spending a weekend with local American family, and attending U.S. cultural events and activities, all while learning new vocabulary and practicing conversational English. UNI CIEP U.S. American culture programs will facilitate cross-cultural understanding and enrichment by providing unique opportunities for cultural immersion, intensive language study, public high school exchange, and travel excursions. Students will be able to meet with native and near-native speakers in a variety of cultural activities that are organized for the entire student body attending the UNI Culture and Intensive English Program.